Twelfth Night is generally considered to be Shakespeare’s most perfect comedy, being an incomparable blend of exquisite poetry, boisterous laughter and bittersweet emotion; all this and music too. We set our productionin the fashionable seaside resort of Illyria in an England benefiting from the sustained prosperity of the Roaring Twenties. It was an era of social, artistic and cultural dynamism with Jazz music blossoming – the so-called Golden Age. Romantic love, and the pain it can cause, are a major focus of the play. Shakespeare’s other romantic comedies – A Midsummer Night’s Dream, The Merchant of Veniceand As You Like It -have stories where the young succeed in romance by defeating the wishes of their elders. Illyria, however, is conspicuously short of inconvenient seniors – it is wholly free of repressive parents. The only person of that generation is Sir Toby Belch and he is far more unruly and permissive than his juniors. The self-regarding central triangle is Orsino, Olivia and Viola who are seen as prisoners of desire. But this can also be said of Sir Toby and Maria, of Sir Andrew and his unrequited love for Olivia and even of Malvolio in his self-love and unresolved passion for his mistress. No long and languorous soliloquies in this play – it’s a racey, pacey, romcom packed with naughty humour, mistaken identity, gender switching, deceit, confusion, rollicks, frolics and beautiful poetry, beribboned and bejewelled in plentiful music from start to finish. Pericles, Prince of Tyre is a swashbuckling adventure story, complete with kings and queens, handsome princes and beautiful princesses, marauding pirates, wicked stepmothers, sleazy lowlife and mysterious wizards; it offers shipwreck, plague, kidnap, murder, hope and despair, love and loss. The fast-moving narrative whisks us around the Mediterranean Sea, to Tyre, Tarsus, Antioch, Ephesus, Mytilene and Pentapolis, exotic locations rich with romantic connotations. We visit ships, palaces, seashores, and a brothel. It is a tale such as old sailors traditionally tell, one that would not be out of place alongside those of Sinbad, Aladdin and Ali Baba in the Arabian Nights. Which is why we shall be setting it in the magical world of Middle Eastern storytelling, where the content hovers in that tantalising zone between reality and fantasy. Pericles, Prince of Tyre is one of Shakespeare's four late 'romances', all of which span a whole generation, allowing him in each case to show us a complete cycle of life. The central characters of The Tempest, Cymbeline and The Winter's Tale all find happiness after many years of pain, providing us with Shakespeare's most memorable and moving final acts. Not to give the story away, Pericles has arguably the best ending of the lot! The fantastical world of A Midsummer Night’s Dream invited us to let our imaginations run riot. 2016's spectacular production of one of Shakespeare’s best-loved comedies did just that, taking us to the grounds of Theseus’ estate, where the mortal and immortal worlds collide. By day a disciplined domain, bound by convention and the established order, when mortal backs are turned the immortals make free – and how! Fascinated by the mortals and their antics, there is always at least one fairy keeping an eye on what is going on, for this is their place, and they were here first. Exotic, colourful, funny and moving, this magical production is inspired by Shakespeare’s changeling child – “A lovely boy, stolen from an Indian king” - and by Hatherop’s own fascinating history. As a dramatist, Shakespeare knew that the interest of an audience is more aroused by a villain than a virtuous 'hero' - so in Richard III he created a witty intriguing character who right from the start of the play engages his audience by laying out his agenda to achieve his ambition of wearing the crown. All the long dynastic speeches, so essential for a Tudor audience to understand the complexities of the Wars of the Roses, were cut so our play moved swiftly with the unravelling of Richard's plots until his inevitable nemesis at Bosworth Field. "This particular play depends so much on having the right lead - we couldn't take our eyes off Gloucester/Richard, he's so charismatic, time flew by"
"Marvellous, bloody marvellous. Great staging lighting, sound. The acting performances were first class with a mesmeric portrayal of Richard III. One of the best (if not the best) WS performance I have had the good fortune to see anywhere." "A spine tingling performance, thank you for a wonderful evening." "The whole cast were marvellous, and as for Richard - utterly brilliant, electrifying, I was completely captivated - it was wonderful." "Just to say how much we enjoyed seeing the performance - excellent in all respects. Please convey our sincere congratulations to each and everyone on and off stage." — if a 5 year old gets the plot, then we must be doing something right! Falstaff moulded scenes from both Henry IV and The Merry Wives of Windsor into a single story based around the character himself, and depicted the real-world backdrop of political turbulence. A live early music band, BroKen Konsort, were on stage throughout the show. Regarded by some as too serious for a comedy but too comic for a tragedy, Measure for Measure has been dubbed a “problem play”. But the comedy doesn’t take over completely, because it is essentially black comedy; and the serious themes don’t swamp us, because they are live moral dilemmas to which we can relate personally. With judicious cutting, an ambitious set, and a good balance between the comic and the serious themes, the audience were treated to an entertaining and thought-provoking evening in the sunshine! 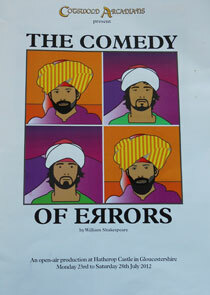 Shakespeare set The Comedy Of Errors in the ancient city of Ephesus, writing a comic romp involving mistaken identities. Could you accept that a master does not recognise his slave, nor a wife her husband? Characters suspected that sorcery controlled events. 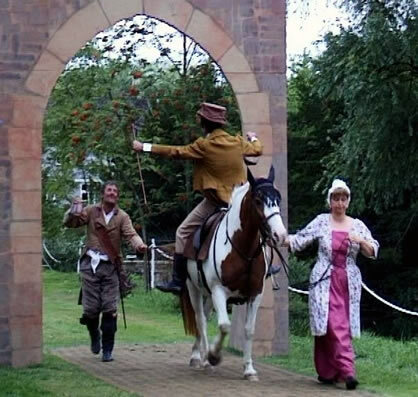 The Cotswold Arcadians summer evening production was one of colourful, fast-paced absurdity! As our first tragedy, Sue Baxter directed the bloody tale of Macbeth against the backdrop of Hatherop Castle in 2011. Cymbeline is one of Shakespeare’s most rarely performed plays – partly because of the length and complexity of its plot, and partly because of its many technical challenges. By judicious cutting, we offered a production that rattled along, between the British court, Rome and the Welsh hills. The interaction between the three stories – the ill-starred lovers, the Roman invasion, and the lost prince and princess – provided a fast-moving spectacle, and a truly emotional ending. When, in 2006, The Taming of the Shrew was first mentioned as a possible play for the Cotswold Arcadians, three members suggested that it might not be a popular play since it has sometimes been criticised as demeaning to women. However, in 2008 the membership chose the play for July 2009 and the auditions produced a promising cast. They soon proved their worth: parts were learnt in the opening weeks of rehearsal, fruitful ideas were developed, and high spirits welded together a successful team which gave our audiences high entertainment and performances of solid worth. We were fortunate in having two principals with a great deal of experience of theatre and especially Shakespearean plays. They were reinforced by a cast whose members ranged from those who had trodden boards and grass for many years to those fresh out of school. Behind the scenes three new volunteers as Production Coordinator, Stage Manager and Front of House Manager provided invaluable support given very willingly. Our veteran Wardrobe Mistress and her assistants worked tirelessly to ensure that the production was well dressed. We were fortunate in having early access to the site, by courtesy of the Headmaster of Hatherop Castle School, and at other times the broad field behind Eastleach Village Hall provided a helpful substitute. Rain fell continuously during the days of performance so that anxious folk drove to Hatherop. As if by a miracle, the skies cleared, and on two occasions at 7.45pm a rainbow provided a backdrop to the Prologue. Gazebos and umbrellas provided a colourful panoply on the lawns demonstrating the fortitude and determination of our patrons at their picnics. Our enthusiastic audiences ― more so on two sell-out nights ― gave our actors their true reward for the long and intensive commitment in that sweetest of sounds; their laughter and their applause. The Winter's Tale is, indeed, a tale and so we set it in a gypsy encampment as gypsy people traditionally stay in one place over the winter, often spending the long evenings singing, playing music, dancing or telling stories. Our production began with the gypsies returning to the encampment at the end of a working day, settling down for a drink and the evening's entertainment. A storyteller was chosen, as was a theme for her story. She introduced the characters, and gradually melted into the background as they and the story took on lives of their own. 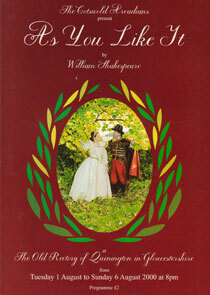 The role of Beatrice in Much Ado About Nothing is one of the most sought after by actresses, and the 2007 auditions were besieged by aspiring candidates. Significantly the chosen one was accepted by a major drama school during rehearsals, as was her Benedick. Both nineteen-year-olds proved their worth and realised the comedy and passion in their roles. During rehearsals, Claudio had to withdraw for personal reasons and his replacement, our redoubtable Puck from the 2005 A Midsummer Night's Dream shone in the role ― this after only a fortnight's rehearsal on coming down from his university. With sumptuous costumes, some recently used in a TV production involving the Tudors (our Duke wore Henry VIII's outfit) the production was match-ready on the last weekend of rehearsal and the actors and support team raring to go. But on the opening night heavy black clouds gathered over Hatherop. Subsequent nights saw a repeat scenario but we were lucky to escape the downpours affecting the rest of England ― until Thursday night when the heavens opened as the play ended and the gales took down part of the set overnight. On Friday night most of the cast and audience could not reach the venue through the floods. Come Saturday night the cast gave their brilliant all ― with just two exceptions who were, as we were performing, being rafted out of their flooded home. An acolyte hurriedly removed cassock and surplice and became Conrade. And a star was born ― although 'on the book' in his first scene, Olly Ashforth-Smith had the words learnt for the rest of the play. Although that Friday was perhaps the disappointing low moment for all, the production sent audiences away entertained hugely by the sophisticated comedy and the cast rose to the challenges presented by the play with verve and spirit. And our two young leads are already launched on what we hope will be rewarding careers. This was our second production of this perennially popular play, which we first presented in 1998. As is usual with Arcadian productions, our Director was able to select a strong cast which included a number of well established stalwarts with a welcome admixture of newcomers in some of the key roles. All of this is set against an almost fairy-tale like story of wooing, misunderstanding, deception and reconciliation. The play is classified as a Comedy but it has a dark centre. It is set in a society characterised by sharply divided social, political and religious beliefs, attitudes and morals. The Christian establishment in Venice at that time is portrayed as decadent and self indulgent. The Jewish community is ghettoised, discriminated against and despised, which fuels resentment, bitterness and an almost fundamentalist antagonism towards established society. This antagonism is personified in the relationship between Shylock and Antonio – Shylock’s reasonable resentment over the treatment of his race and person having warped into something dark and corrosive. It was the aim of Paul Cahill, our Director, to bring out the bright light and dark shades of these contrasts, and his vision and patience were instrumental in the success of the play, which again featured the father/son team in action, with father David in the role of Shylock. Our patrons, the public, who are not backward in letting us know what they think, seemed unanimous that this was one of our best productions and we are grateful for their support. Potential directors who wish to direct a production for Cotswold Arcadians are always asked to present their ideas and format to a meeting of the members, who then vote to select their preference of Production and Director. When David Sherratt presented his idea of a semi-promenade production of A Midsummer Night's Dream moving the audience from Athens, represented by the North face of the Mansion, to the forest amongst the trees in the grounds, the membership were enthusiastic, whilst some members of the Committee were doubtful about logistics. In the event, the audiences, led by a medieval bagpiper, enthusiastically embraced the concept, uprooting themselves willingly from the comfort of the covered stands to return to Athens led by flaming torches. Mercifully, it never rained! Auditions proved popular and very competitive. The Director chose four teenagers as the lovers, Demetrius, Lysander, Hermia and Helena. A risk? Certainly ― but each rose to the challenge competitively, and their energy and vigour swept the audiences along. Gravitas came with Titania and Oberon whose sophisticated quarrellings and storms acted as a foil to the noisy youngsters. 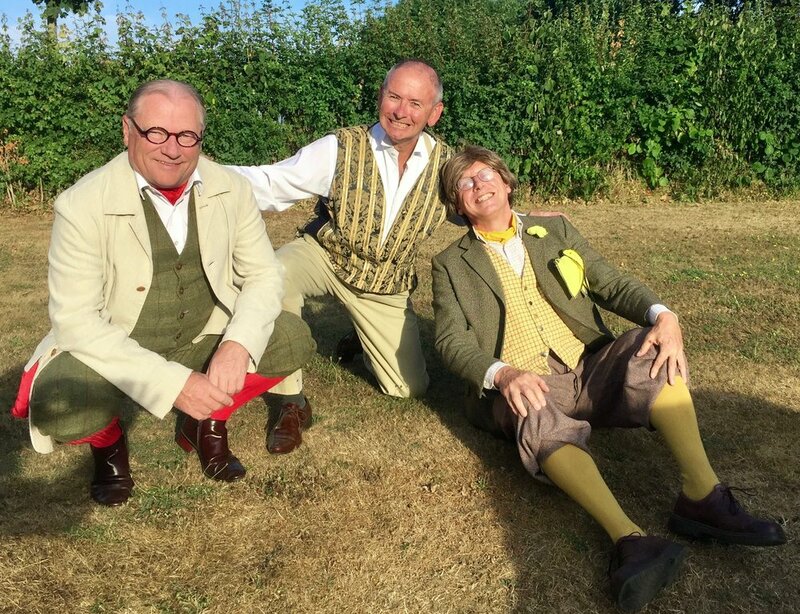 Fortunately, the Cotswold Arcadians have solid, experienced comedy players, and Bottom and the Mechanicals proved their worth; even when their cart collapsed on the opening night they absorbed it into their tomfoolery. Sadly, Bottom's donkey cart did not appear ― the narrow Cotswold lanes on the route home proved too dangerous for a horse-box. Children infested the scenes as energetic sprites, two danced memorably for Titania and earned plaudits from their audiences even when their music failed. Puck enchanted his audiences not least because of his tremendous energy and acrobatic cavorting ― without even being short of breath. Green painted 'fairies', dishevelled lovers and all comes right in the end, even when an old lady from the audience, carrying a plastic bag, walked right across the stage during the reconciliation scene. Our four, undaunted, played on like true professionals. A Midsummer Night's Dream, in spite of Pepys's condemnation "the most insipid, ridiculous play that I ever saw" remains one of Shakespeare's most popular plays and the 2005 audiences went away gratified, charmed, and cheerful. Even the Director expressed himself pleased! The Comedies are the customary fare for amateur Shakespearean productions and the Arcadians had been through the lot and had presented some of them more than once. Antony and Cleopatra was the exception and, although it had been a great success, the proposal that we should 'go for broke' and stage King Lear was felt by many to be a bridge too far. A great play, of course, but was it too demanding for any Director who could be persuaded to take it on, for the actors available to us and, principally, would it be too much for our loyal audiences? After some debate we took the 'brave' (some might have thought the 'foolish'!) decision to go ahead. It proved to be an outstanding choice. It was challenging and fulfilling for everyone involved in the production both on stage and off. Although it was not our biggest Box Office success – some of our regulars may have felt it would not be a Summer's evening confection to go with their picnics – all those who came were impressed and moved. Immediately after the production we had the distinction of featuring on the front cover of Amateur Stage and, four years later, when acting as Front of House Manager for The Winter's Tale, our Lear was stopped every night by members of the audience to discuss the production. This kind of recognition made it very special. David Cahill, who played Lear, had acted in three previous productions and directed The Tempest the year before. Our Director for King Lear was his son Paul, who in an earlier existence had been a professional actor, writer and director. The family involvement was completed when Valerie, David's wife, took on the role of Wardrobe Mistress and did a superb job in organising the costumes, ensuring period authenticity and arranging the horrifying logistics of the many changes involved – she was overheard after the final night saying 'never again'! We would not want to put on a play like this every year but it has put down a marker defining what we are capable of. 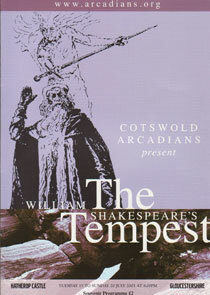 The Tempest was probably written in 1611, when it was first performed. It is a play demonstrating the full maturity of the playwright's craft both in terms of the beauty and complexity of the text and of the ambiguities of the characters and plot. It is unique in the canon in as much as all of the action is controlled by the leading character, Prospero, who is completely in charge of events from the beginning to the end. Twelve years before the play opens Prospero was overthrown as Duke of Milan and set adrift with his baby daughter, Miranda, in a leaky hulk. Eventually they were cast ashore on an enchanted island where they have since lived. Prospero is a magician and, by his magic art, has established himself as ruler of the island and master of its spirits. His two principal servants/slaves, both of whom crave their freedom, are the airy spirit Ariel and the earth-bound, sensual, Caliban. As the play opens those responsible for Prospero's overthrow are sailing past the island and are shipwrecked there by a storm which he has created. The shipwrecked company become split up and the action witnesses their tribulations as they are manipulated to the final confrontation with Prospero. The play has the qualities of an enchanted dream, complete with romance, comedy and some of Shakespeare's finest poetry. It is possibly unique also in the number of new versions and sequels it has generated. The 1598 edition of Love's Labour's Lost is the first printed play text to carry Shakespeare's name, but was probably written earlier in 1593 or 1594. The plot is one of the few Shakespeare invented himself, though including several contemporary references. Even if Catholic, Henry of Navarre, (a kingdom straddling the border between France and Spain), was a popular hero in Elizabethan England. The three lords - Berowne, Dumaine and Longueville - who join the King of Navarre in a vow to devote three years to austere study, avoiding the company of all women, are named after leading figures in 16th century France. The arrival of the Princess of France with three of her ladies leads to the comedy of embarrassed attempts by the men to conceal from one another that they are falling in love, and thus breaking their vow, and the ladies' practical joke of exchanging their identities when the men, disguised as Russians (at the time figures of fun because of their over-elaborate formality), come to woo them. The sub-plot is peopled with characters taken from commedia dell'arte, who reflect facets of the lords' personalities: Costard and Jacquenetta (the 'yokels'), open-hearted and uninhibited; Don Armado, full of pompous affectation; Holofernes, the schoolmaster; and his admiring companion, the curate Sir Nathaniel, demonstrate the pedantry into which the lord's verbal brilliance could degenerate. For the play's title page proclaims it "a conceited comedy" and it is the sophistication and beauty of the language that is at the heart of this delightful play. Since 1991, the River Garden productions of the Cotswold Arcadians had been set in many different époques — Shakespeare's own period, the 1930s, the 1950s and the late 1980s — but, never until then, had a play been set in BC 42-30 when, of course, the events portrayed in Antony and Cleopatra did in reality take place. Antony and Cleopatra is perhaps the most quoted of all Shakespeare's plays, and contains a richness and sophistication in text that is not really matched in any of his other works. It is, moreover, written very 'filmicly' — with short scenes (often of as few as five to ten lines) — a factor which lends itself to rapid pace in story-line development. Moreover, the characters portrayed in the play are giants of our common classical heritage. Whilst Antony and Cleopatra themselves have become bywords for doomed victims of impossible love (providing a poignant re-exploration of the Romeo and Juliet predicament in middle age, and with an equally tragic ending), the towering presence of other characters like Octavius Caesar — destined to become the first Emperor of Rome (Augustus Caesar), and the Emperor who was ruling (appropriately) two thousand years ago — bring to the play an unmistakable reflection of present day political manoeuvring, in which 'affairs of the heart' can (and predictably still do) so often destroy promising careers. With its large cast (the play, as written, required no fewer than 42 speaking roles — but we combined some of the smaller ones to create more interesting challenges for the actors), as well as its set-piece extravagances, the potential for customary Cotswold Arcadians spectacle was well catered for in Antony and Cleopatra. Moreover, with the full participation of The Ermine Street Guard, audiences were able to experience the awesome ingenuity, manpower, and equipment that gave the Roman Military Machine well-nigh unstoppable momentum. Moreover, the river craft provided and operated by members of Thames Barge, besides being essential to the plot, also illustrated the skills which were required as a matter of day to day survival around the coasts of the Mediterranean from those days up until the present time. A wrestling match takes place near Duke Frederick's Court. After hearing of the prowess of the Wrestlers, Duke Frederick sends his Court Wrestler Charles to take on the three proponents. Charles overcomes them easily and issues a general challenge to the men of the area. This challenge is taken up by Orlando, the younger brother of Oliver de Boys. Orlando is tired of the treatment meted out to him by his cruel brother and, after overcoming Charles, he takes his brother's old retainer, Adam, and flees to the Forest of Arden. What? A satellite dish in a Shakespeare play? 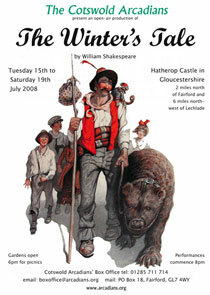 The narrative and dialogue were, of course, written by Shakespeare; but the Cotswold Arcadians' 1999 spectacular was set amongst the perpetually warring tribes of the Hindu Kush ― where members of a TV satellite news-gathering team found themselves hopelessly ensnared by a change in the local balance of power amongst the fundamentalist Mujahideen. There were machine guns, a significant amount of incoming mortar and shell fire, a lot of smoke, and a broken elbow suffered by (it had to be, hadn't it?) the character El Bhow ― but he nobly played out the run. With one of the Arcadians' highest budgets and a production team of about 150 people, this production involved the active co-operation of the Royal Logistics Corps at South Cerney, RAF Brize Norton, RAF Fairford, the USAF and Cotswold Land Rovers Ltd.
Those who remember Sandy Gall and Vernon Mann of ITN with the Mujahideen in Afghanistan in the 1980s were not surprised that the Director of Measure for Measure was Richard Cleghorn-Brown, whose technical team had smuggled into the war-zone the world's first portable satellite TV transmitter ― which actually featured in our production, along with another of Richard's original musical scores. 1997 was The Year of The Young; and it was to Director Oliver Clauson that fell the unenviable task of assembling and manipulating large numbers of Teens-and-Twenties into Capulet and Montague gangs for a Shakespearian period Romeo and Juliet. James Harpham produced another original musical score; and frighteningly realistic sword fights, with real stage swords, were created under the direction of Paul Benzing from the National. The secret to such realism is, of course, expert tuition followed by lots of practice, and no one was actually wounded by a sword; but we did have one casualty — Tybalt had to play the last three nights with a badly sprained ankle. The universal opinion was, however, that The Young really did convince; and Central TV also did a nice piece on the show. The summer of 1996 was possibly even hotter than that of the previous year, and Beryl Rees' Jane Austin period production of The Taming of The Shrew also played at both Quenington and Sandringham; this time in front of the house itself, without real fruit (as in the previous year's Twelfth Night) but with amazingly simulated victuals for Petruchio's servants to throw around the stage. At least one lovingly and meticulously constructed chicken was lost to the waters at Quenington on the only night it rained (the shower timed by someone precisely to occupy the interval ― no more, no less). The staging of this play became more elaborate than ever before and involved two walk-way bridges running onto a River Stage constructed only part way across the river, so the potential for unscheduled bathing was great ― but only one member of the cast succumbed to the temptation. The play also saw the introduction of Molly ― an amiable and (luckily for Petruchio) tolerant pony ― on which he had to make his first entrance riding backwards. Molly didn't even seem to mind the fireworks. The summer of '95, like the one which was to follow, was a scorcher. 1995 saw Oliver Clauson's in-period production of Twelfth Night , again with an original musical score — this time by James Harpham — and featured a lesson learned by Orsino the hard way. In striving for realism, Orsino had augmented the artificial fruit (with which he customarily toyed whilst requesting music if it were "the food of love") with a bunch of real grapes - a fact which had not passed unnoticed by a local colony of wasps. The resultant raid called for a significant exercise in self control in the face of eight wasp stings before the completion of the first speech in the play. Mercifully, the audience did not appear to realise the predicament of the sad, but now manifestly wiser, Duke and when, the next week, the entire production decamped to stables at Sandringham Park for a further four days in front of a Norfolk audience, Orsino did not repeat the experiment in authenticity! One of the reasons why the 1994 play Much Ado about Nothing — another David Gaylor in-period production — occasioned an innovation in presentation was the construction of the first of our Bridge Stages which allowed the action of the play to flow not only from one river bank to the other but also to take place over the very water itself. 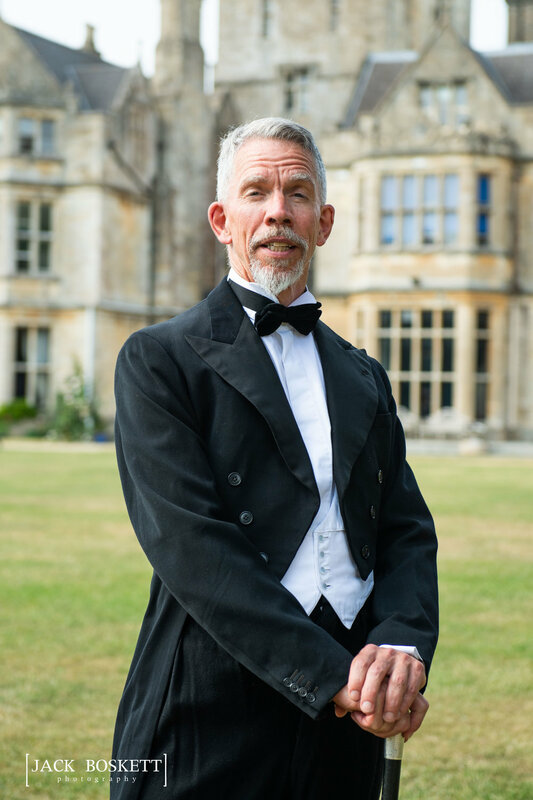 In addition, it was the first Cotswold Arcadians show to employ a musical score specially composed for that particular event by Richard Cleghorn-Brown. It also saw the most monumental collaboration between man and nature: when, in the Tomb scene, a smoke generator went berserk at precisely the moment when Jove decided to bless the Cotswolds with what was to be the most momentous electric storm of the summer. The other amazing innovation of the play - the fireworks, specially constructed by Reg Strange - were hard pressed to match those of the firmament, that evening. Having repaid its startup loans, and even made a little money in hand from The Dream , the Cotswold Arcadians could afford a larger audience capacity (and seats, at last) for Jean Steel's 1993 production of The Comedy of Errors set, this time, in a 1950s epoch. The fun to be had from mistaken identity is considerable; that of scouring the Cotswolds for two sets of identical male twins who can act, rather less. Solution: one man to play both Masters and one to play both Slaves and, Hey Presto... but wait! Overworked twins unite to declare the impossibility of running right round the periphery of Old Rectory to enter, suitably disguised, from the far side of the stage with enough wind left to deliver their alter egos' lines! Answer: a flow of cod Shakespeare which lengthens the play by a good two minutes and gives 'the boys from Syracuse' a chance. "You have doubled the length of my part", complained the Courtesan. "And I don't understand a word of it!" No complaint from the audience, though, who seemed to enjoy this larky play as much as the cast. Or was there a lurking audibility problem - a question to be seriously addressed in 1994. For our second season, David Gaylor gave us A Midsummer Night's Dream. Again set in period, lovely to look at and full of magical conceits, it was performed in idyllic weather. The audiences were enchanted by Titania floating down the river with her fairies, standing on a silently moving boat, the stage mist gently curling round them; and, having delivered a large slice of her mind to Oberon, disappearing, still erect and serene, behind a curtain of weeping willow. The audience stand was thronged with semi horizontal patrons (not at all the worse for their picnics — in those days we could not yet run to seats) for this most beloved of English pastoral plays. This was the year when we dispensed with a prompter, abandoning the cast on an ocean of words — a decision we have never reversed nor regretted. 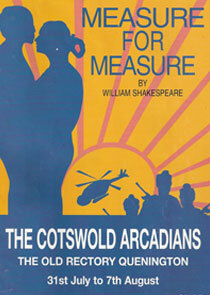 The Cotswold Arcadians' first production, in June 1991, was The Merry Wives of Windsor, and was set in period and directed by David Gaylor for what today seems an unbelievably small amount of money — of the order of £600. While exposing the follies of Middle England circa 1590 in a spirited way, we were able to throw Falstaff into a real river. Now, you don't get that at the National Theatre!